Interested in watching NFL Game Pass online from abroad? 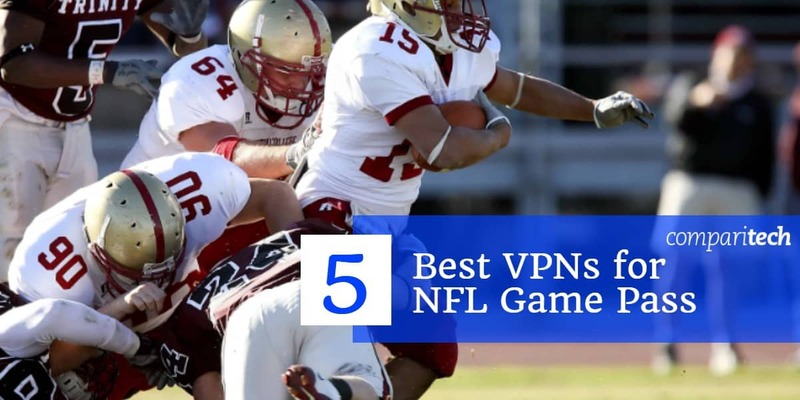 In this article, we’ll explain how you can use a Virtual Private Network (VPN) to unblock and live stream from geo-restricted platforms including NFL Network, Fox Sports, and ESPN, no matter where you are in the world. Most streaming platforms only make their content accessible to users in certain countries. However, VPNs enable you to connect to servers all over the world. By doing so, you’re assigned a temporary IP address from the target country. This tricks sites into believing you’re located in that country, and grants you access. VPNs aren’t just for streaming, though; they encrypt all of your data, allowing you to keep your activities private. When using a VPN, your traffic is unreadable by your internet service provider, network administrators, and even hackers. ExpressVPN Our top choice. Super fast servers geared for high-quality streaming. Unblocks NFL Game Pass and most other popular US streaming sites with ease. Apps are easy to set up and use. Great privacy and security. 30-day money back guarantee included. NordVPN A good value choice with numerous servers located in the US to assure good quality NFL streaming. Great privacy features. CyberGhost Budget choice that is capable of HD streaming speeds. Good array of servers in the US. PrivateVPN Unblocks NFL Game Pass and many other popular streaming shows. Choose a suitable VPN from the list below (we recommend ExpressVPN). Download and install the correct version of the software for your operating system. Connect to a server in the appropriate location. To use the NFL Game Pass, you’ll need an American server. Try loading content from your chosen platform. You should find that it loads quickly, without displaying any error messages. HOW TO USE A PREMIUM VPN FOR FREE: Most VPNs only offer their lowest prices to people who commit to several years of coverage. However, if you’re on vacation or only need a VPN for a short time, you can use ExpressVPN’s 30-day free trial. You will have to pay up front, but can cancel at any time within 30 days to receive a full refund. ExpressVPN is an excellent choice for people who like to stream thanks to its high-speed connections, expansive server network (28 US servers, covering 18 different states), and superior unblocking capability. In fact, ExpressVPN is one of the few remaining VPNs which can reliably unblock stubborn streaming platforms like Netflix or BBC iPlayer, so NFL Network shouldn’t pose an issue. ExpressVPN boasts a series of robust security features including 256-bit encryption, DNS leak protection, perfect forward secrecy, and a kill switch that stops data transfer whenever you lose connection to the VPN. As ExpressVPN doesn’t log any personally identifiable information, your activities cannot be traced back to you. This VPN also offers 24/7 support via live chat in case of any problems. ExpressVPN offers user-friendly software for Windows, MacOS, and Linux PCs, as well as apps for Android and iOS. You can even manually install it on supported network routers. THE BEST VPN FOR NFL GAME PASS:ExpressVPN is our #1 Choice. Optimized for high-speed connections. Excels at unblocking NFL Game Pass and most other popular streaming services. Hard to beat on privacy and security. There is a 30-day no-quibbles money-back guarantee so you can try it risk-free. When it comes to network size, few services can compete with NordVPN. It has almost 1,900 servers in the US alone, and some are even optimized for streaming HD video. As such, it’s an excellent way to stream with the NFL Game Pass safely. Best of all, NordVPN, in addition to NFL Network, is able to unblock many similar services including ESPN, FOX Sports, and CBS All Access. This provider offers experienced users several ways to create highly-customized security setups. It uses 256-bit AES encryption with DNS and IPv6 leak protection by default, but you can also choose to enable a program-specific kill switch, use two VPNs at once, connect to Tor over VPN, or block ads and malware automatically. It logs no personally identifiable information and accepts bitcoin payments, meaning you can stay as anonymous as possible. This VPN has Android, iOS, MacOS, and Windows apps. It works with Linux-based devices and certain internet routers too, although manual configuration is required. BEST BUDGET VPN:NordVPN is great value. A good all-rounder that reliably unblocks NFL Game Pass content. Strong security features and accommodates up to 6 devices. Includes 30-day money back guarantee. CyberGhost is a little different from most other VPNs in that it allows you to either choose a server manually or select an activity (such as unblocking streaming sites) and be assigned one that will work. With 464 high-speed servers spread across the US, you’ll be able to watch the NFL live, with no noticeable buffering. The good thing about this service is that despite its simple aesthetic, it’s very secure. Users can take advantage of 256-bit encryption, a kill switch, HTTPS redirection, ad-blocking, and anti-malware features to stay protected online at all times. CyberGhost doesn’t log any session or activity data, and protects against DNS, IPv6, and port-forwarding leaks, so you can rest assured your activities will remain private. CyberGhost comes with apps for Android, Windows, iOS, and MacOS devices. It can be manually installed on Linux and supported routers. Over 200 servers in the US get around most geo-restrictions. EASY TO USE:CyberGhost is great beginners' choice. A budget choice. Good on privacy. Can stream NFL Game Pass content in HD video quality reliably. Hit and miss connections with some other popular streaming services. 45-day money back guarantee. IPVanish currently has 479 US servers to choose from, and the service has minimal impact on your networks speeds, making it a strong choice for streaming live HD content like NFL match coverage. One of the things that sets this VPN apart is that you can connect up to ten devices per account, whereas most of its rivals allow five or six. This means you can protect every device in your household with one subscription. It may have a lightweight app and a simplistic design, but IPVanish punches above its weight when it comes to security. It has 256-bit encryption, a kill switch, and DNS leak protection enabled by default. There are a few more advanced options such as LAN traffic blocking, data obfuscation, and regular IP address switching to take advantage of. Additionally, IPVanish doesn’t log any personally identifiable information. This is one of the few services with an app in the Amazon Fire TV store. With software for Windows, MacOS, Android, and iOS, you can protect yourself on all devices. IPVanish can be manually configured to work on Linux systems and select wireless routers. UP TO 10 DEVICES:IPVanish is great for families and multiple connections. Easy to use with NFL Game Pass users and preferred by users who need high standards of privacy. Can’t unblock as many other streaming services as some of its rivals. 7-day money-back guarantee. PrivateVPN may only have ten servers in the US, but it provides faster speeds than many similar services. It’s fast enough to stream live video with no noticeable buffering or lag, and can unblock popular services like Netflix, BBC iPlayer, and Hulu. Further, with six simultaneous connections allowed and strong multi-platform support, you can stream NFL matches to whichever device you prefer. This VPN comes with 256-bit encryption, a kill switch, and protection against DNS and IPv6 leaks enabled by default. It has a strict no-logging policy, meaning your activities remain private at all times. PrivateVPN excels at customer support, with 24/7 live chat available. A support agent can even remotely install the software for you if you’re having trouble. This service has apps for Windows, Android, MacOS, and iOS devices. It works with Linux and some routers, but this requires manual configuration. Can I watch NFL Game Pass with a free VPN? You’d be forgiven for thinking free VPNs are a good way to stay safe online. After all, they purport to offer the same type of service as their premium counterparts. However, we strongly suggest avoiding free VPNs for several reasons. Firstly, their infrastructure is constantly inundated with new users, which causes network slowdown. This manifests as choppy, stuttering video and pages that take forever to load. This is hardly ideal for watching live, HD sport. Although free VPNs don’t bill their users directly, they still exist to make a profit. Unfortunately, the real product free VPNs offer is their users. By placing ads onto the sites you visit and tracking your activities, free VPNs can make money from you as you browse. Even if you never click a single ad, they’ll gather plenty of data that can be used to build a consumer profile and sold to a third party without your knowledge. Lastly, free VPNs pose a significant threat to your security. Many purported free VPNs are just Trojans looking to install malware onto your device. It’s not just smaller, little-known services either: we’ve seen a well-established free VPN sell its users’ bandwidth to be used in a botnet. When it comes to online security, you can’t be too careful. That’s why we recommend using a reputable, privacy-conscious VPN instead. The 2018/19 NFL season is set to start on September 6 and conclude on February 3, 2019. There are obviously too many fixtures to cover here, but you can find matches by team or by date on the NFL website’s schedule page. 13 Can I watch NFL Game Pass with a free VPN? 8 Can I watch NFL Game Pass with a free VPN?